Marco tardito (alto saxophone, arrangements), Giorgio Giovannini (trombone), Stefano Risso (double bass), Donato Stolfi (drums and percussioni). 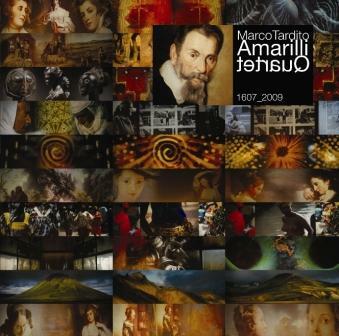 The repertory is surely unusual in the field of improvised music; re-arrange madrigals from the 17th century for Jazz performers is not an easy task, but Marco Tardito shows here great capability as arranger and saxophonist. The arrangements are precise and bring tasteful ideas, while the interpretations of the quartet are rich of creativity and expressive balance. Amarilli Quartet is an instrumental band, which is exploring inside contemporary music, featuring the mixture of many expressive languages and recalling various cultures. The repertory of Amarilli Quartet is here the Madrigals of C. Monteverdi. Thesemadrigals, that Monteverdi started composing in 1600 and had been published in 1607, use the miniaturized lyrical experiments of G. Chiabrera. Starting from the texts of the madrigals (as the musicians of the time did) I have experienced a different approach to musical composition. The interpretation of the words of the text added a modern freshness, enriched by references that belong to our musicians history. The choise of the madrigals on 3-voicings has been done because these allow to reproduce the original harmony with a totally different sound; at the same time, the original meaning of these tracks (created to play, sing, dance) permitted a different rhythmic approach, closer to african percussions than to Jazz rhythms.